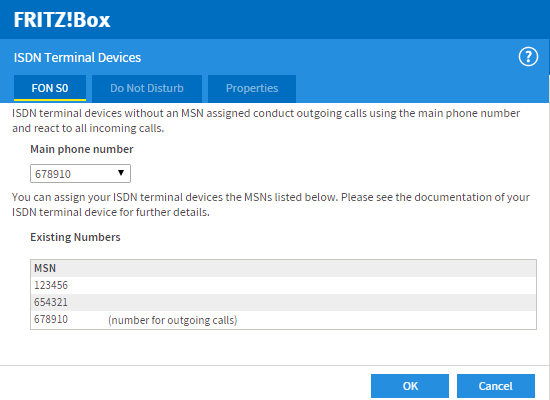 If you connect your ISDN PBX to the FRITZ!Box, the devices connected to the PBX can use all of the telephone numbers that were entered in the FRITZ!Box. The ISDN telephone system must be suitable for use on an ISDN point-to-multipoint line. Connect the PBX to the "FON S0" port on the FRITZ!Box. Enable the option "ISDN PBX", click "Next", and follow the wizard's instructions. In the PBX, define which numbers the extensions should react to when you receive calls and which number should be used to make calls. Enter the numbers in the PBX the way they are displayed in the settings for the ISDN PBX in the FRITZ!Box user interface (see fig.). If you assign an internet telephone number to an extension, and that number is identical to a landline number, then outgoing calls from this extension will be made over the internet. Note:Sometimes a number may be too long for you to enter the complete number in the ISDN device. If this is the case, do not enter the entire number. Instead, enter as many of the last digits as possible.